For OEMs wanting real productivity, the Unitwin 6000 is a state-of-the-art machining centre. It cuts cycle times on axle manufacture dramatically – down to as little as 4½ minutes per axle! Equipped with twin spindles that operate either simultaneously or independently, this unique all-in-one solution can machine various kingpin angles. And because the spindles tilt, the Unitwin 6000 can perform all sorts of operations: milling, drilling, boring & reaming. 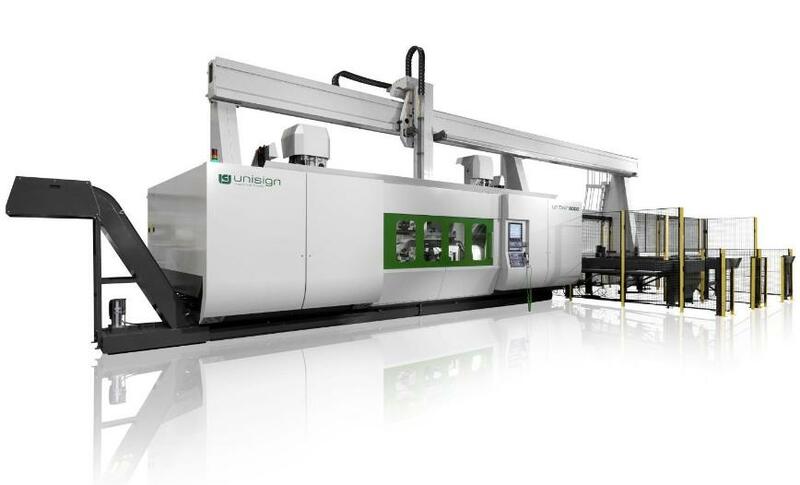 It’s a complete machining centre, offering an excellent return on investment. Produce front axles faster and at lower cost. It’s really possible with the state-of-the-art Unitwin 6000. The unique twin main spindles of this innovative, turn-key solution can be tilted to machine various kingpin angles. And when operated simultaneously the two spindles cut cycle times dramatically. If you’re looking for quality and productivity turn to Unisign, the market leader in reliable CNC machines that offer excellent return on investment. One machine that can do so much. With two tilting spindles plus A-Axis, the state-of-the-art Unitwin 6000 can perform all sorts of operations: milling (including outer circumference), drilling (including cross holes and spring pad holes), boring & reaming. Yet versatility isn’t the only gain from this turnkey solution. You also get higher productivity and lower manufacturing cost per part: the automatic loading crane provides quick parts changeover, while the two independently operable spindles allow fast tool changes too. And that means near-continuous production. Intuitive operation, and safe too! A machine this versatile and flexible can still be a dream to operate. The Unitwin 6000 programming method has been optimised for front axles: a full product program can now be generated by simply entering the required parameters of the beam. And you can rely on 3D zero-point correction for optimum positioning too – so your setups will always be accurate. A large variety of front axles can be clamped and fixture changes for less common beam types are easy to do. This state-of-the-art machining centre is safe for operators, with a fully enclosed working area that offers a really good all-round view of the complete process.